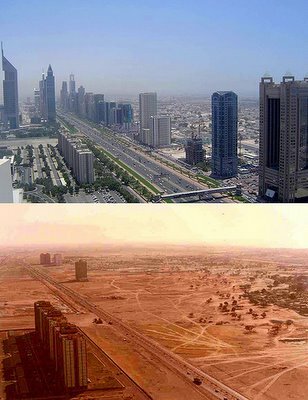 Or Dubai after and before: it's a somewhat jaw-dropping look at the Sheikh Zayed Road, prior to and after the recent building boom. Photographer and source unknown. (If you know, leave a comment). And, with any luck, more on Dubai soon. but I don't know if they're his or someone elses. Would love to know the dates for the 2 photos. They actually reminded me of my 2 childhood visits to Orlando (1977 and 1984), where deserted roads with attractions/hotels on scattered lots on my first visit were suddenly incorporated and 'downtown' on the next. Looks like 1991 and 2005? The 'after' pic looks more like late 2003/early 2004. I reckon the 'before' pic is much earlier ... 1987/88 perhaps. I grew up & live in Dubai so those pictures made me smile (and long for days when driving on the Sheikh Zayed Road wasn't a traumatic experience!). The 'before' picture must be around 1979/80 just after the Trade Centre and related Apartments (foreground) were completed. I have a 1990 aerial photo of the Emirates Golf Club which I'll try and post. Water everywhere from a phenomenal rain storm. I found these images on the BBC website. They credit the photographer as Pier Pistocchi, and date the images from 1991 and 2005. You can see my blog post about this here.